Gastric dilatation and volvulus (GDV) or bloat is a condition in which the stomach becomes distended with gas. In some cases the stomach is distended with fluid or food. As the stomach becomes distended, it usually twists in a clockwise direction. After the stomach is twisted and distended, the esophagus and duodenum become twisted and kinked off, thus trapping the gas in the stomach. The twist in the stomach not only makes the pet very uncomfortable, but also impairs the blood flow to the stomach, thus if left untreated may result in death of the stomach and ultimately death of the patient. Another event that occurs is occlusion of the main vein (vena cava) leading from the back half of the body to the heart and resultant shock. Shock, a condition in which there is inadequate perfusion of the body with blood, is fatal if not treated. A number of breeds are commonly affected by stomach bloat. 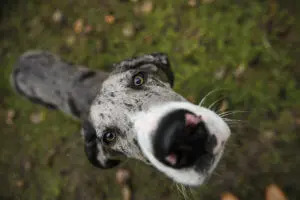 About 50% of all Great Danes will bloat during their lifetime. About 1 in 5 Irish wolfhounds will boat in their lifetime. Other susceptible breeds include Standard poodles, Blood hounds, Akitas, Irish setters, German shepherds, Dachsunds, and Labrador retrievers. Females and males are equally affected. Clinical signs of bloat include unproductive retching, abdominal distension, pale gums, rapid heart rate, and weak pulses. The diagnosis of bloat is confirmed with abdominal x-rays. Initially, intravenous fluids are administered to help reverse shock. Next, the patient is anesthetized and a tube is passed from the mouth to the stomach to relieve gas and fluid buildup. The stomach is then rinsed with water to remove ingested food. The patient is then take to surgery and the stomach is untwisted. The stomach is tacked to the right side of the body wall (called gastropexy) to prevent the stomach from twisting again. Sometimes a portion of the stomach has died (necrosed) and needs to be removed. If too much of the stomach is dead, euthanasia may be recommended. If the spleen has developed blood clots, it is removed. After surgery the patient is carefully monitored in the intensive care unit. Intravenous fluid therapy is continued after surgery. In some cases, artificial plasma (Hetastarch), plasma and blood transfusions may be needed. Pain is controlled after surgery with a variety of medications. Blood pressure, EKG and other vital signs are closely monitored. If treated early, about 90 to 95% of the dogs having surgery to treat bloat will survive. If a portion of the stomach is found to be dead at the time f surgery, the survival rate decreases to 50%. Patients that have bloated are predisposed to abnormal heartbeats that if left untreated uncommonly may result in death. Disseminated intravascular coagulation uncommonly occurs and results in dysfunction of multiple internal organs, bleeding disorder, and commonly death. Breakdown of the stomach tack (gastropexy) occurs less than 5% of the time. Chronic recurrent bloat occurs infrequently, but usually is due to very poor function of the muscle of the stomach. Medication may be administered to improve the stomach motility, but this will be effective in about 50% of the patients. A gastropexy (stomach tack) can also breakdown and result in recurrent bloat and twisting of the stomach, but this is unusual (less than 5% chance). 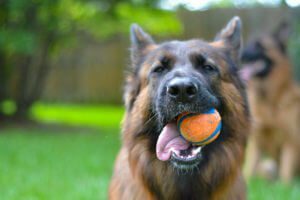 A preventative surgery can be performed to minimize the risk of GDV in high-risk patients such as Great Danes, German Shepherds, Blood Hounds, Irish Setters, Irish Wolfhounds, Standard Poodles, and other susceptible breeds. Great Danes are at very high risk and research has shown that one in two Danes will bloat in their lifetime. This surgery is done laparoscopically via two small incisions and the aid of a telescopic camera. The surgery can be done as early as 6 months of age (at the time of neutering). 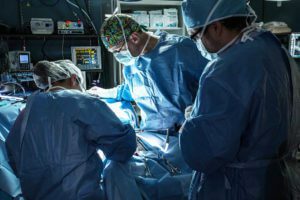 This procedure has minimal morbidity, less anesthesia and surgery time, short hospital stay (done as an outpatient surgery), and is less expensive than treating GDV.